*The Kennebec River Gorge is a perfect rafting trip for all levels of rafting experience and children as young as 5 years old are welcome by the guide service to participate on some trips. The Lower Kennebec Gorge is the easier, more relaxing whitewater stretch with only small rapids. This is a great chance to relax, soak up the sun and beauty of the Maine outdoors! 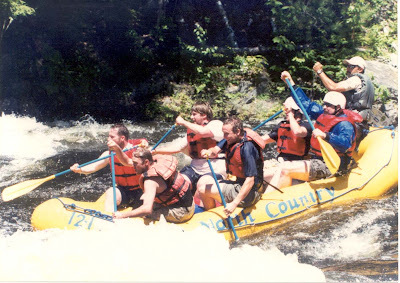 A few years back, I was invited to attend a weekend excursion to the upper reaches of the Kennebec River to participate in a rafting adventure. Never one smart enough to pass up an opportunity where there is significant risk to life and limb I gladly accepted the offer. Upon arriving at our campground in “The Forks”, I began discussing the next day’s activities with my amigos and was informed that as a greenhorn I should be prepared for “quite” a ride. Apparently, they had miraculously linked our trip to coincide with one of the largest dam releases of the season and they exuberantly predicted that a set of rapids named “Big Momma” was going to have her way with me. Knowing that their taunts were only designed to prod for weaknesses in my emotional armor, I offered a thin smile and continued sipping on a local brew aptly named “Moose Piss”. At around 7:00 AM my alarm sounded and I was relieved to see bright sunshine streaming in through the tent screen. The fickle nature of Maine’s weather had me half expecting to make this trip either in the pouring rain, a blinding blizzard or perhaps both. Current conditions aside, I still heeded the old outdoorsman’s motto “cotton kills” and pulled on my polyester long sleeved t-shirt and shorts. To protect my lily-white completion I wore a white baseball hat, sunglasses and a liberal coating of SPF 30 sunscreen. On the feet of many of the veteran paddlers, I noted Tevas but I instead opted for an old pair of tennis shoes. Lastly, accompanying me would be a small dry bag containing a lightweight fleece pullover, winter hat, extra sunscreen and a waterproof disposable camera. By 8:00 the group was beginning to assemble and our rafting guides provided a brief lecture served with a side order of coffee and doughnuts. A clipboard was then circulated stating something to the effect, “Rafting is inherently DANGEROUS and if you were in fact to DIE it would be our own damn fault”, my life flashed before my eyes as I signed my name. At this point, we were divided up and provided with our assigned raft and guide. Seeing that my team was provided one of the more seasoned guides I silently prayed that older did in fact mean wiser. Grabbing all of the other required gear from the guide service life jacket, paddle and helmet I was then quickly herded onto the bus with all of the other hooting and hollering crazies and we started out for the designated launching point. Arriving at the “Dam” I was surprised with the huge number of other rafting companies who were also scurrying around like ants at the launching point. Dozens of boats and people were crowded around the waters edge waiting their turn to launch their rubberized crafts and proceed to their doom. A number of young and fearless individuals were even attempting the 4-6 foot high rapids (2-4+ on a 1-6 scale) with nothing more than a lifejacket, swim fins and boogie board! I cringed to think what “White Washer” and infamous “Magic Falls” might do to an unprepared and/or unlucky individual. Sooner than expected, it was our turn to launch and within seconds we were swept away in the fast moving waters of the Upper Kennebec Gorge and struggling through approximately 7 miles of non-stop thrilling whitewater action. My memory of those 7 miles is foggy to say the least. The incredible power of the rapids in the Upper Gorge with standing waves and large drops combine with the fast moving waters of the narrow canyon to create a powerful sensory experience. I strain to hear the guides commands over the roar of the rapids and with a supreme effort, I will my muscles to bite the paddle deep into the tormented waters. I quickly look around and see that there is a look of concentration on the faces of all of the rafters and as we roll I am surprised to see that our team begins to develop a rhythm. What in the first few minutes had seemed like garbled mayhem was now morphing into the workings of a well-oiled machine. As our small craft slams through Big Momma, White Washer and Magic Falls I can help smiling and letting out a couple of excited shrieks! To soon, however, the upper rapids are behind us and we jump in and float with the current feeling the power of the river as we lazily float downstream. At the half way point, we stop to have a riverside lunch and are treated to an incredible selection featuring grilled chicken, hamburgers, hotdogs, potato salad, pasta salad, rolls and drinks. Filling myself beyond maximum capacity, I am relieved that the remainder of the trip is spent slowly paddling down the lower Kennebec Gorge watching bald eagles and ospreys, moose and other woodland creatures. The last 7 miles are spent taking photos, recounting all of the excitement of the morning and enjoying the stories from our guide.